CSIRO, Australia's national science agency, and agtech startup Ceres Tag are working together to make smart ear tag for cows which would deliver similar data to the one delivered by consumer smart watches. The GPS enabled devices are especially useful for farmers as it will allow them to track where their cattle graze, if an animal has escaped or been stolen and even the abnormal movements which could point at things like whether an animal is giving birth or is sick. The 'fit bit' type smart tag has already had several successful trials at CSIRO's Lansdown Research Station near Townsville, Queensland. The sole aim of this new technology is to save farmers' money and time. Manually maintaining herds is time consuming and requires some sort of vehicle and hence costly. The smart tags are made to give greater transparency over grazing management. It will allow farmers to easily locate and monitor their animals thereby reducing risks & operating costs, improve efficiency and assist with traceability. "The tag is GPS-enabled, allowing farmers to track the location of individual animals remotely, via Internet of Things (IoT) capability," David Smith, CEO of Ceres Tag, said. In case of an unusual activity like theft and other disturbances caused to the herd, the tag's onboard accelerometer can send out alerts. "Our focus for future iterations is to create a smaller and lighter tag, as well as added functionality such as a temperature sensor, which could alert farmers to illnesses at an earlier stage", Dr Ed Charmley, Group Leader at CSIRO said. 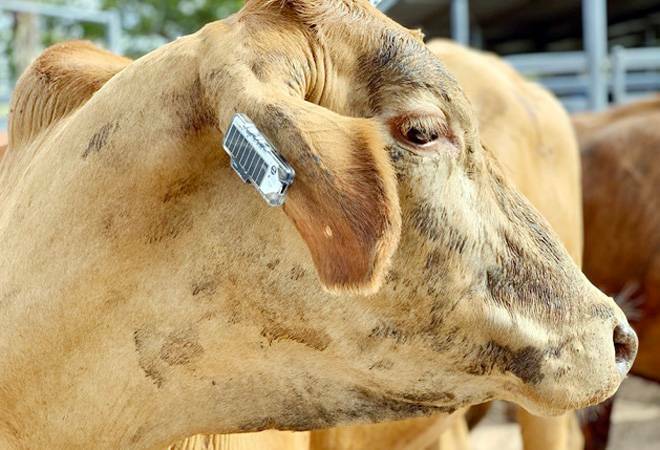 In a statement, CSIRO said that it hopes to become the world's first smart ear tag "accredited for provenance to international traceability standards, including Australia's National Livestock Identification System (NLIS)." The smart ear tags are designed to last the entire life-cycle of the cattle in Australia's unique weather.